The Unprimed Basswood panel is handcrafted using a non-flexible basswood top, sanded perfectly smooth and ready to seal and prime with the ground of your choice. Compared with other wood panels on the market, the Unprimed Basswood is sanded perfectly smooth and lacks plywood seams, knots or raised fibers providing the cleaner, more professional look artists’ want. The support frames are made with quality solid pine strips that can be finished with paint or stain. Unprimed Basswood is great for encaustic, mixed media, collage and wood engraving and accepts all types of painting grounds . Available in two standard cradled profiles, 7/8” and 1.5”, both are simple to hang or frame. You can find a chart on the standard sizes here: Standard Sizes for Unprimed Basswood. Ultra-stable, these wood panels will not give, bend or flex and like all Ampersand’s panels, they are made with quality materials that have been tested not only for durability, but also for performance with artists’ paints. For ideas on how to treat the edges of the cradle, consult this article on hanging and framing. We have reviewed how to size and seal wood and how to prime it with oil primer. Some of you may prefer to use an acrylic primer, or an acrylic dispersion ground for you work. Our best recommendations for the process are below. Golden® brand acrylic gesso is our first recommendation. However, these instructions are virtually interchangeable with a number of other brands if there’s one you like better or have more readily available. Gesso is a flexible liquid ground that seals, protects, and gives “tooth” to wood panels, which promotes good paint adhesion. It comes ready-to-use, but can be mixed with water for thinner applications. Golden® Gesso is available in Black or White, and can be mixed with Golden® Acrylics to produce a range of colored grounds. Gesso can be applied with a brush, roller, putty knife, Catalyst™ wedge #W-06 or sprayed on. Dilution of the Gesso is only necessary for spray application, but may be desired for brush or roller applications as well. When diluting with water, use a maximum dilution of 25%. Any mixture within this range offers little risk of cracking or other adverse effects. A size is a thin solution (often a weak glue) that is brushed directly onto a support. Sizing or sealing is recommended to protect Ampersand’s uncoated panels from support-induced discoloration when using acrylic gesso. If wood is not sized or sealed properly before applying the gesso, yellowing can occur because water [a solvent] can cause acids, occurring naturally in wood, to migrate to the surface. In fact, it is extremely important to properly seal any and all un-primed wood substrates to prevent support-induced discoloration that can cause your paint film to yellow over time. Hardbord™ is manufactured using Aspen fibers, a wood with a very low acid content, but still needs to be sized and sealed. The Natural Wood Panel™ and Unprimed Basswood panels are made with a thick basswood plywood top that has been sanded ultra-smooth. They are both seamless and knot-free and provide a perfectly smooth and uniform painting finish. When you size and gesso the basswood surface, you won’t experience the raised wood grain fibers that can happen with some other rougher types of plywood; the surface stays nice and smooth. The basswood panels have solid wood cradles and braces that may be more susceptible to moisture and environmental changes than the birch plywood cradles we use on the Hardbord™. Therefore, Ampersand recommends that you prime both the front and back of the Basswood top to ensure long-term stability of the panel. The best products we have found to seal wood are Golden®GAC100 [2 coats] and Gamblin® PVA Size [4 coats]. Apply Golden® GAC100 directly to the basswood or hardboard surface with a 2″ paintbrush or putty knife. Apply to the front and back if applicable. Allow the GAC100 to dry completely and follow with an additional coat. Do not sand between layers. Before applying oil primer or the painting ground, allow the GAC100 to dry for 1-3 days so that the sealer can coalesce into a uniform film for maximum protection. If you’re using Gamblin® PVA Size, use 4 coats and follow the same application instructions as for the GAC100. Thin the gesso with up to 25% water for the first coat so that it will flow more evenly on the [sized] panel. Use a 2″-3″ brush for the first coat and a foam roller for subsequent coats. Begin by working the gesso back and forth with the brush in one direction and then in a cross direction with a little pressure so that the gesso penetrates the panel better. Apply gesso to the side edges of the panel and the plywood cradle if applicable. Don’t forget to seal the cradle with Golden® GAC100 first if you are going to gesso the edges for painting. The basswood panels have solid wood cradles and braces that may be more susceptible to moisture and environmental changes than the birch plywood cradles we use on the Hardbord™. Therefore, Ampersand recommends that you gesso both the front and back of the basswood top to ensure long-term stability of the panel. Allow the front of the basswood to dry completely, then, gesso the reverse side. After the first coat of gesso is dry, smooth out any rough spots with light grade sandpaper. Apply a second coat of gesso with the foam roller (or brush). Allow it to dry and then sand again. For best results, apply a minimum of 2 coats of gesso and sand in-between. Subsequent layers of gesso will produce an even smoother painting surface. For spray-application, you may have to apply more than 2 coats to achieve a film similar to a brush application. For basswood panels, follow the same instructions, but also prime the back. For each additional coat to the panel face, apply the same number of applications to the panel back. The fall sale is on! 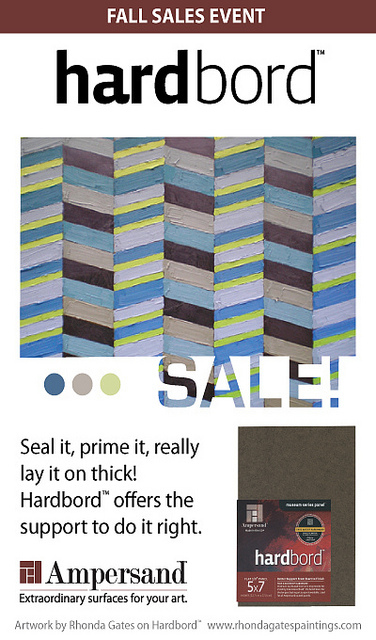 Hardbord, Gessobord, Claybord, Encausticbord and all Artist Panels are all on sale, 20% to 60% off at a dealer near you! For those of you that purchase our museum quality panels, Aquabord™, Encausticbord™, Pastelbord™, Gessobord™ or Claybord™, we complete the sealing and priming for you on the front of the panel. However, for anyone who is choosing to do their own sizing and priming for oil painting, these instructions for priming in oil will be helpful. Our Hardbord™ panel and the Unprimed Basswood Artist Panel both require sealing and priming before use. All wood panels must be sealed (also known as sizing) before painting in order to put a barrier between the naturally occurring chemicals in wood and the painting ground. Support Induced Discoloration (SID) occurs when a panel is not properly prepared and these chemicals leach through to the paint on the surface. By choosing a denser panel with a low acid content, an artist greatly reduces their risk of SID. However, all wood panels should be sized (sealed) and primed before painting to ensure their longevity. Gamblin® Oil Painting Ground is our first choice in a good quality oil primer. However, the following instructions are virtually interchangeable with a number of other oil painting grounds if there’s one you like better or have more readily available. Gamblin® Oil Painting ground contains an alkyd resin vehicle that allows it to dry within a matter of hours. A number of other pre-made oil primers are also available and generally, they are made up of a white pigment, linseed oil and driers or solvents. Primers that use alkyd resin binder instead of linseed oil dry faster and are non-yellowing and more flexible than traditional grounds. Both may be applied in the same manner with either a large putty knife or a large stiff bristle brush. If you are using a traditional oil primer, it may need to be thinned with Gamsol® to a workable consistency enabling easy application over the sized panel. Never add oil to a primer. Its leanness must always be preserved. A size is a thin solution (often a weak glue) that is brushed directly onto a support. Sizing or sealing Ampersand’s uncoated panels is recommended to protect against SID. In fact, it is extremely important to properly seal any and all un-primed wood substrates to prevent support-induced discoloration that can cause your paint film to yellow over time. Hardbord™ is manufactured using Aspen fibers, a wood with a very low acid content, but still needs to be sized and sealed. The Natural Wood Panel™ and Unprimed Basswood panels are made with a thick basswood plywood top that has been sanded ultra-smooth. They are both seamless and knot-free and provide a perfectly smooth and uniform painting finish. When you apply the size and primer to the basswood surface, you won’t experience the raised wood grain fibers that can happen with some other rougher types of plywood; the surface stays nice and smooth. The basswood panels have solid wood cradles and braces that may be more susceptible to moisture and environmental changes than the birch plywood cradles we use on the Hardbord™. Therefore, Ampersand recommends that you prime both the front and back of the Basswood top to ensure long-term stability of the panel. The best products we have found to seal wood are Golden® GAC100 [2 coats] and Gamblin® PVA Size [4 coats]. Hardbord™ is available in either a flat 1/8″ panel, with a 3/4″ cradle, or with the 2″ DEEP cradle. The Natural Wood and Unprimed Basswood panels are available in both a 7/8″ cradle and 1.5″ cradle profile. You have the choice of painting all the way around the cradle or leaving the natural wood showing for framing purposes. Be sure to size and seal the bare wood if you want to paint completely around the edges of the cradle. Or, to protect the wood from paint and primer, cover the sides of the panel with painter’s tape up to the edge of the surface. Do not remove the tape until the painting is finished. Painter’s tape does not leave a sticky residue like many household masking tapes that can be difficult to remove, and will leave a pristine surface underneath when the painting is complete. Begin by mixing small amounts of Gamsol® with the primer to thin if necessary. You can test the right consistency by picking up the paint with a knife and shaking it gently. If it falls from the knife like soft butter, it is ready to use. When priming with a putty knife [or wedge tool], begin by placing a portion of the oil painting ground or primer in the center of the [already sized] panel. Spread it in one direction, and then in the opposite, and finally in a diagonal direction. Clean the putty knife and run it over the ground to smooth and even out the surface. Also, prime the edges of the panel and the cradles if applicable. Don’t forget to apply GAC100 on the cradle edges first if priming them for painting. When the first coat of oil painting ground is completely dry (about 7 hours), lightly sand the surface with a sanding block using light grade 400/grit sandpaper. A second coat can be applied the next day or any time after the first coat is dry. If using basswood, for each additional coat to the panel face, apply the same number of applications to the panel back. Eliminate any unevenness on the finished primed surface by lightly sanding the panel after it has thoroughly dried. The finished primed panels should be allowed to dry completely at room temperature before painting. 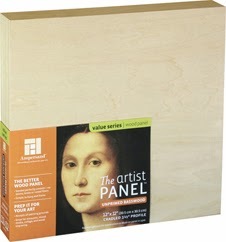 If you prepare several panels at a time, then you will have stock on hand that is dry and ready to paint when needed. Below is a video produced by Gamblin with Scott Gellatly, technical director, explaining how to prime a painting. All wood panels must be sized, or sealed, before painting to contain the natural chemicals within the wood that can break a painting down over time. Support Induced Discoloration (SID) occurs when a panel is not properly prepared and these chemicals leach through to the paint on the surface. By choosing a denser panel with a low acid content, an artist greatly reduces their risk of SID. However, all wood panels should be sized (sealed) and primed before painting to ensure their longevity. Traditionally, panels were sized (sealed) with hide skin glue before applying the Gesso grounds. However, current research has shown that hide glues like rabbit skin glue do not completely seal the surface, and deteriorate over time. Conservators consider a PVA size or acrylic resin a superior modern substitute for hide skin glue. If you are sealing your own panel such as Ampersand’s Hardbord™, we recommend using GAC100 from Golden®. This is a superior sealer for panels. Its high resin content seals the panel very well and forms a good film on the surface. GAC100 also forms a good foundation for proper adhesion to layers of gesso. With Ampersand’s coated surfaces such as Claybord™ and Gessobord™, Ampersand uses their Archiva-Seal technology to seal their panels prior to applying their painting grounds. This technology employs a specialized method to apply their proprietary sealers so that the actual fibers of the board are sealed. This sealing process creates a barrier between Ampersand’s acid-free coatings and the hardboard surface, ensuring that an artists’ work will be protected over time. Prior to sealing, make sure your panel is clean of any dust or debris. Some experts recommend that you slightly sand the surface of the panel to ensure good adhesion. Note that Ampersand Hardbord should not be sanded. Removing the top layer of tempered fibers can cause the panel to warp when gesso is applied. Next, apply GAC100 liberally with a brush onto the panel. Take a putty knife or spatula and work the GAC100 into the fibers of the panel while it is still wet. Smooth it out and let this first layer dry. Next, apply two additional coatings with a brush, letting each layer dry in between coatings (no need to sand between layers). Make sure that the sealer is evenly distributed throughout the surface. It is highly recommended that you seal both sides of the panel to retard moisture penetration on the front and back and to equalize both sides of the panel to prevent warping. Hardbord™ is one of the few panels we offer unprimed and unsealed as a raw wood surface. There can be great pleasure in working directly on raw wood. However, for long term stability, we recommend sealing all unprimed wood panels, including our own, to protect against support induced discoloration (SID), warping and adhesion issues. Whether you’re working in acrylics, oils, encaustics, alkyds or tempera, paint will adhere best to surfaces that have been properly prepared using archival practices. A size is a thin solution (often a weak glue) that is brushed directly onto a support. Sizing or sealing is recommended to protect Ampersand’s uncoated panels from support-induced discoloration (SID) when using acrylic gesso. If wood is not sized or sealed properly before applying the gesso, yellowing can occur because water [a solvent] can cause acids, occurring naturally in wood, to migrate to the surface. In fact, it is extremely important to properly seal any and all un-primed wood substrates to prevent support-induced discoloration (SID) that can cause your paint film to yellow over time. Hardbord™ is manufactured using Aspen fibers, a wood with a very low acid content, but it still needs to be sized and sealed. Sealing only the “paintable” side will possibly lead to warping if moisture or pollutants leach through the raw wood cradles or backing. So, seal the entire panel for the ultimate protection. To apply the size, use a wide flat brush to lay on 2 layers of GAC 100 or 4 layers of Gamblin PVA size, allowing each to dry completely before applying gesso layers. For more complete directions click here to read about sealing with Acrylic Gesso and click here to read about sealing with Oil Ground.